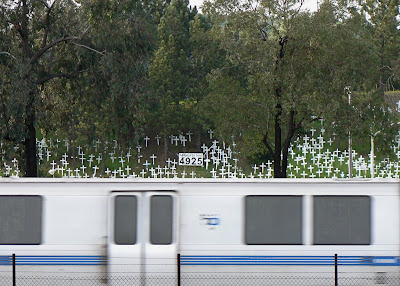 The Contra Costa Times reported on the Lafayette Crosses Memorial. The steep path of steps is worn into the dirt of the Lafayette hillside, meandering between thousands of white wooden crosses. It was not there when Jeff Heaton started pounding the crosses into the ground in November 2006 to symbolize the American troops killed in Iraq. That was one of the bloodiest periods of the war. The crosses sparked protests, against the war and against the monument itself. They attracted vandals. A battle was fought before the City Council about whether they should stay. Now, as violence has waned, vocal debates have subsided. reporters use them as a landmark. They are known far and wide; people from other regions who meet Lafayette's city manager say, "Oh, that's the town with the crosses." "I think that they're really part of our community now," said Louise Clark, the 83-year-old Lafayette resident who owns the hillside. "Now I want the acceptance to turn into a concern about why they're there." On Thursday, the sixth anniversary of the beginning of the war in Iraq, organizers held a vigil at the crosses, a few months after President Barack Obama was elected in part on a campaign promise to withdraw troops from Iraq. New crosses are still being put in twice a month. While Obama is set to withdraw troops from Iraq, he has also said that he will increase the number of troops in Afghanistan. Crosses organizers decided last year to add crosses for troops killed in Afghanistan, as well, bringing the total to more than 4,000. "I'm hoping that we don't have to have any more crosses up there, but so far that has not happened," Clark said. "I have many visions of it maybe being a memorial garden where many artists donate their own vision of a memorial to the soldiers who have sacrificed," he said. Jim Minder sees the display differently — as an insult to soldiers and their families. He is the co-founder of the Lafayette Flag Brigade, which welcomes soldiers arriving home. The group protested the creation of the crosses; Minder calls it a "mock monument" because those who created it oppose the war. "You've got to look at the people," he said. "They're against every war. They don't pick good or bad wars." The vocal protests have stopped, Minder said, because the city is committed to letting the crosses stay, he said. City officials required cross organizers to shrink the sign displaying the number of troops killed in Iraq. The City Council also changed city law to limit the number of signs on a parcel, so a new display like the crosses would be illegal. Since the crosses were already there, the new law did not affect them. The city continued to receive letters and phone calls about the crosses after the council debates were done, City Manager Steve Falk said. "The call volume peaked both when the council was in the middle of making the land-use decisions and when the war was at its most controversial." Now they have trickled off to nearly nothing, he said. Most military families still oppose the monument, Minder said. Those who like it, he added, should consider the antiwar views of those who created it. Military families are some of the people who appreciate the monument most, he said. "It's become a really legitimate memorial," Heaton said. "People come by and express a lot of gratitude that they have something like this to visit and look at." Sometimes those people are veterans, he said, and they are often the most grateful. In the long run, Minder's fear for the crosses resembles Heaton's hope. "One thing can start out as a mock memorial and it can turn into a real memorial," Minder said. "That's what I was worried about." I sang a song of mine at the Veterans Day, 2009 event last Wednesday. If you care to listen to the recording of "It Seems To Me", here it is: Song at the Crosses. And if you care for more, here's a Sacred Jazz Sampler. I am a military member myself, and many members of my family are also. I support the two wars we are fighting, and don't think that we should pull out of either of those two countries until the job is done. That being said, I greatly appreciate the Crosses of Lafayette. It doesn't matter if they started for one political reason or another, they are now a public reminder of the human cost of war, which is something we need to be reminded of; that the wars are not something that lives in our TV's and newspapers, but is something that greatly affects many of the families in this great nation. News coverage disappeared when Iraq deaths fell, Afghanistan deaths increased, and the liberals realized those were Obama's crosses now.